There’s an interesting thing happening in Mansfield, OH. A church put up several billboards, but people thought the billboards were actually put up by an antheist group. Why? Because the church got a little too creative with their marketing and lost the message. McElroy Road Church of Christ in Mansfield, Ohio wanted to create a marketing campaign that would cause people to stop and think. So, they put up several billboards with thought provoking messages. 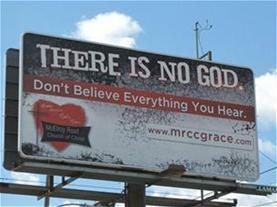 The sign causing the most controversy (seen above) has “THERE IS NO GOD.” in huge letters at the top of the billboard. Obviously, this is what draws people’s attention. In much smaller letters below that the sign reads, “Don’t believe everything you read.” and then there is the church’s web address and logo. The billboard gets people’s attention. They used the church’s web address so people can find more information. There is no God and you shouldn’t believe what you are hearing at McElroy Road Church of Christ. If you think about it long enough, the first interpretation makes more sense. 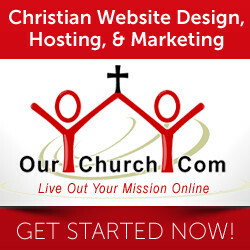 After all, why would an atheist group include the church’s web address rather than their own web address. But we’re talking about a billboard here. Most people will have about 3 seconds at most to take in the message and their sharing their focus with driving and whatever else is going on the car (radio, discussion, kids, etc.). Can you really expect people to evaluate the meaning of an unclear message or even catch all the parts of the billboard during that time? According to the Mid Ohio Atheists (MOA) organization, they’ve received messages congratulating them on the sign and they thanked the church for advertising their views for them. The church has also received several angry emails from Christians about the signs, though the Pastor (Frank Moore) said that once the sign was explained, those people were supportive. That doesn’t sound too good, but then again the church is getting some media attention, including blogs (like ChristianPost where I learned about this and, of course, our blog). So, I guess it depends on whether you believe that any publicity is good publicity. I think getting publicity for being controversial can be good if it defines you in a good way. A church that takes a very public stand against abortion with positive message about life may be controversial, but it defines the church in a way the church wants to be known. On the other hand, being controversial because people misunderstood the message you were trying to get out is probably not the kind of publicity that is helpful. When marketing, it’s important that your message is able to be clearly understood. Here are a few ideas to help ensure your church’s marketing message is effective. Test the message with outsiders. I recommend letting some people not affiliated with you church see your marketing message before you put it out there. People in your church have a certain bias in the way they think that people outside your church do not have. So, it’s important to know how the people you are marketing to will receive the message. This is also true of internal church marketing. Let members of the church (not just staff) review those internal marketing messages. Keep your marketing channel in mind. A message that will work in Facebook, may not work on a flyer or a billboard. Tailor your message for the marketing channel. Keep the attention getting aspect of your marketing in line with your message…or at least don’t let it be in conflict. It’s important to get people’s attention, but that shouldn’t come at the expense of hurting your message. In the end, I think McElroy Road Church of Christ’s intentions were good, but their execution wasn’t so great. They let their creativity muddle their message. Getting attention is good. Enticing people to respond to your message is great. Confusing people with your message is not good. Despite the confusion, do you think the billboard ad will work? Do you have any examples of effective or ineffective church marketing messages? Way too often within Roscoe circles most of us realize that a head features hit a brick wall morally. Frequently it's a head of important visibility including Ted Haggard or even Jimmy Swaggart. Some other periods it is someone not known for the masses but nevertheless nicely recognize inside their instant circles of affect. Each person is unique in this respect, and I like it. I hope that every man for himself is aware of the importance of this! Most of the sites are very helpful to all students and colleges for the develop their knowledge and gain some communication skills and for the continues the applications of the process contains. What a great article regarding Don’t Loose Your Message In Your Creativity. I become happy to find this site. you continue to sharing such kind of stuff here. Learning adds to the all inclusive community's minds to a staggering level and associates in clearing each one of the qualifications in the overall population. It makes us prepared to end up a good learner and see every edge on life. It offers ability to see all the human rights, social rights, commitments and commitments towards country. Forte schools offer a FREE trial Music Lessons Sydney and some offer a Free Trial private lesson. The billboard are the old way to convey your message toward the peoples and that is also used today. Peoples add lots of designs and creativity and their message become hide in their which is useless. The message must be open and write in clear word which are easy to understand.